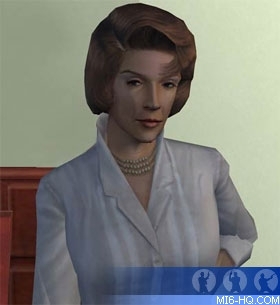 MI6 caught up with Karly Rothenberg, who voiced Rosa Klebb and Miss Moneypenny in the videogame adaptation of "From Russia With Love"
How were you approached by Electronic Arts to provide the voices of Rosa Klebb, Miss Moneypenny, and various Party Guests in "From Russia With Love"? My agent called me in for an audition/voice match for the role of Rosa Klebb. I happen to be quite good at matching certain vocal tones and inflections and this one just seemed to fit like a glove. A few days later, my agent called and said I had booked the job! It's just that easy sometimes. The producers listen to thousands of submissions and somehow, miraculously, pick the voice they like for the role. The rest of the voices were additional characters done spontaneously during the recording session. In a lot of video game and animation projects, a producer will hire you to do more than one voice just based on what they hear with one audition. When and where the voice-overs recorded? Was the recording process any different to those of other projects you've work on? The session took place at a recording studio in Los Angeles. The producers usually pick a studio that is conveniently located and can accommodate their particular needs. This recording session was a bit different than most. It required Mo-Cap, [motion capture] - the technicians actually illuminate your face with tiny beads that reflect light. It picks up facial movement so that the vocals match the animated characters. Because of the nature of Mo-Cap, there is a bit more of a challenge with technical recording details. You really have to maintain your focus to keep the character alive while all this other stuff is going on. 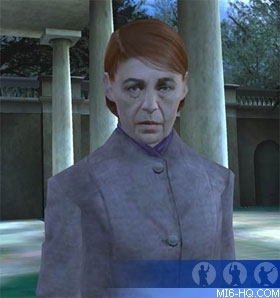 Would you describe to us the process of recording a Rosa Klebb sounding voice for the game. How difficult did you find it to replicate her voice? Rosa was very detailed. The first thing I did was research Lotte Lenya herself. She was an amazing film and theatre actress and getting to know about her life was very important to me. Then it was a matter of listening to her vocal inflections, her accent, and watching the movie "From Russia with Love" about 18 times before my audition. You portrayed the classic voice of Miss Moneypenny too, how did you go about recreating the actor's original voice? I was given a voice match of Lois Maxwell's voice and for some lucky reason, Miss Moneypenny and Rosa Klebb just seem to be in my range of vocal tones. It's really quite an honour to portray the voices of these talented ladies. I have always loved the nurturing way Miss Moneypenny looks out for James, and as far a villains go... Rosa Klebb is the best. I worked on these characters with the utmost respect for the actors work in the original film. The more authentic, the better! Do you feel that the Bond games are now becoming interactive movies of their own? I think the Bond game series has been incredibly true to the films themselves. They took great care to find the perfect voices, personalities and energy of each character to make the whole experience more authentic. And, best of all they got Sir Sean Connery himself to play Bond! I also feel that these days, the companies truly respect the video game art form. They create a totally interactive experience for all gamers. What did recording Party Guests entail? I guess you could say I sort of had a "Robin Williams" moment in the studio. Basically, I improvised myself as various people at a party just chatting. So I sort of talked to myself and carried on non descript conversations with, well... me! Were you provided with any art or in-game footage of the scenes you were creating voice-overs for? Does having the ability to see the role you’re providing a voice for improve the quality? No art was reviewed in the recording studio, but I did my research and went to the website to get an idea of what the other games looked like. 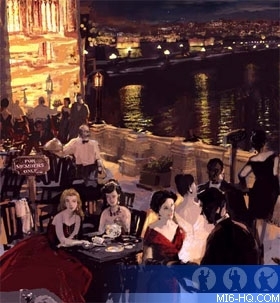 The producers had the DVD of “From Russia with Love” as a reference for me when I was in the studio. I was also very grateful that the producers had a sincere approach to allowing me to take all the time needed to authenticate the characters. They were some of the best producers I've ever worked for. How do you feel modern technology benefits a voice actor when trying to create believable voices? I think it's truly amazing the technology available to voice actors these days. I even have my own in home practice studio. I'm also amazed that I can record a session in one place and it can be sent to New York where the producers of a particular project are on the other end directing me. There is so much available to the voice actor today in forms of education, knowledge, practical application, that it all makes for better quality performance every time. Do you feel it is an advantage to have on-screen acting talent when providing voice-overs for scenes in a game? I feel that most of the industry looks for "name" talent when they are casting because it gives credibility to a project. Unfortunately, it sometimes leaves the "little guy" out of a job. For feature animation in particular, it can be frustrating to always be up against a movie star whose name is more important than your own. I do believe that every work experience an actor can gain in, whatever venue they choose, will always benefit their work in voice acting. I've been acting on stage since I was 9, and from there, my training and experience has just been an amazing journey. I think learning how to interpret the written word is of paramount importance in any aspect of the entertainment industry. How do you train to become a voice actor? I studied with an amazing voice acting coach that was recommended to me in Los Angeles, Dolores Diehl. She embraced all aspects of voice acting and truly cares about educating her students. I studied with her and various members of her faculty for almost 2 years before I made my demo reel or tried to get an agent. Once I had produced my demo reel, I continued to study animation and narration with her, and I still attend classes when I can to brush up. I also have the honour of working privately with another amazing coach, Ginny McSwain, who offers individual coaching for working actors. Is it a profession that anyone can get started in? I think that the voice is the most distinct “fingerprint” we have, and I believe that anyone can explore voice acting if they have a desire to. The thing you need to remember about any endeavour is that hard work and dedication are key to being successful in whatever you choose. With voice acting, you really have a chance to find a very unique niche and with the right classes and commitment, anyone can do it! I do feel that having some kind of acting background is important but there are a lot of voice actors who never pursue on camera or stage acting and they do great in voiceovers.